I am completely uninterested in being badgered about social causes when I visit a site for expertise. I literally do not care what the cause is. I don't care which political groups support it even if those are the same as political groups I personally agree with, and I am disinclined to spend time here if on every page I have to scroll past some kind of social/political guilt trip. I am disgusted by the recent Internet trend of people scrambling whatever platforms they have access to to win votes for some political stance, and I hate that Stack Overflow is doing this now too. Bingo. Where does it stop on the Stack Overflow network? "Just this once, because this cause is the important one (but the other causes aren't)" is terrible logic. I disagree with both of these points. Your vote on this question should reflect the merit of these points for discussion. There is a risk of a slippery slope. You don't want to see banners advertising every political cause. There are very, very few situations that are important enough to try to get your attention. I hope that we continue to make the right call as to what's really important and what's merely nice to have, but it's always a judgement call. Time for me to break out my favorite generic response: "I think the answer lies in the middle ground between the two extremes." Here, the extremes are "never promote social causes" and "promote all kinds of social causes." In general, I agree with you. Stack Overflow very clearly defines what is on-topic — as does each Stack Exchange site — and social causes are definitely off-topic. 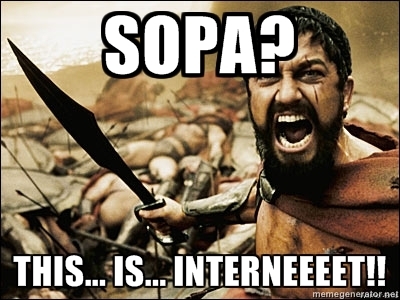 However, in the specific case of SOPA, I think the message is valid. The admins are putting up a legitimate claim that SOPA could cause serious damage to Stack Overflow, or even shut it down. That makes the SOPA system message relevant to SO. And every organization behaves differently when its very survival is at stake. Now that I have your attention, let's get to the point. The very fact that this picture exists illustrates why free Internet is important. The fact that I could mash up a picture using a well known meme to convey a message and the fact that memes exists at all is thanks to the gears and cogwheels of the established web communities. It's not the 'ordinary' web sites that will be first hit by this new law. The first ones on the line are web communities, especially those with user generated content. Because if it's user generated, it's not supplied and sold by a big company. If you can get amused by watching web series over YouTube, you (supposedly) won't pay as much for Hollywood ones. So, it's not just Stack Overflow, it's also Wikipedia, redit, etc. Basically, it's the creative part of the Internet, which is at a highest danger. To break or even just risk breaking that network of people is more that just to take away another source of amusement from them. It would mean breaking our lines of communication and setting us back decades ago, when most of web was read-only and it wasn't all that different from other media like TV, where you would get only what you've been served. Q1: Should Stack Overflow display social/political awareness campaigns? A1: In general case - no. It shouldn't be a social/political platform any more than it should be an obituary page. It this specific case though, it is clear that the issue may severely affect both the site and its community. A2: It will affect us, so I say we should care. At least enough to talk about it even if we cannot influence anything... or can we? Q3: But, my country X doesn't have such laws! A3: If USA enacts it, the rest will follow. At least some of them, and some is too many. We can either bury our heads in sand, pretending that we don't care for the bill, and pretending that we are not just waiting for the same to happen in our countries.. Or we can spread the word about the dangers and what is at stake. Will it make a difference? Maybe... maybe not... probably not. Is it worth at least trying? Yes! This is hardly an isolated incident, and Stack Exchange, Inc (ie, the actual company) has re-iterated time and time again that this is their platform, and when they choose to do this the community really has no recourse but to bear with it, though they justify it with some pretense that it's actually on topic. The list will doubtless grow. Much has been written both for and against these situations, but there's only one thing that appears to be missing from the conversation: honesty. In the early days of Stack Overflow I used to play a game I liked to call "The Hamburger game." There were all sorts of questions programmers could ask each other beyond what we get today. For instance, "Programming on a boat?" or "What's your favorite hamburger, as a programmer?" Ultimately it was determined to tighten the focus even further, and the primary reason was because we wanted to retain experts who didn't have time or interest in wading through crap. I enjoyed, therefore, the challenge of creating a "hamburger" question which passed muster with the community, and several similar questions at the time. Rather than asking "What hamburger is the best" I had asked for algorithms to track hamburger toppings and how to manage complexity for invalid situations (seeds on buns for a bunless hamburger, for instance). It's fun taking an off topic question and reasoning a way to make it just barely on topic enough to justify its inclusion in an area where it doesn't belong. The reality is that of the issues above, only SOPA ever posed an existential threat to Stack Exchange, LLC, and even that was unlikely - there were many paths SE could have taken had the proposed legislation gone into effect. The other social, political positions are just that - social and political positions. They are calls to action, and in every case save SOPA, they were decided upon by Joel Spolsky, co-founder and CEO of Stack Exchange, Inc. Not everyone on the network agrees with them. Not everyone wants to be involved. Further, even many of those who are interested in them agree that they shouldn't be on the network. But worse than all that is the pandering attempt to justify them as somehow on topic. They are, at best, hamburger questions. Gun reform, but for programmers. Small business grants, but for programmers. Animal rights, but for programmers. I'm not going to argue against inclusion. That's already decided, and the decision is that Stack Exchange, LLC may, from time to time, inform all users of issues that Stack Exchange, LLC and/or its leadership finds noteworthy and they will attempt to turn their users into activists for causes they feel compelled to act on. We, as a community, simply have to accept that we will be called on to act in Joel's favor from time to time, and in return he will continue to provide the service he's always provided. What I'd like to stop, though, is the false pretense deployed, the justifications that suggest that these are somehow magically on topic. They aren't - and you can tell because each time this happens we lose experts. If we cannot maintain our laser-like focus on issues that are appropriate and topical we will continue to do so, but that's social capital spent, and I'm sure it's an expense Stack Exchange, Inc is happy to spend if it obtains the desired results on their social or political issue. However, if Stack Exchange, Inc and its officers and spokespersons come clean, accept and explain that these are not on topic, and that the company will occasionally do this and the community simply has to accept this, then we may at least stem the loss of some experts, but more importantly, we won't be encouraging dishonesty and having to suspend our disbelief when such things come our way. This policy should be well articulated in a FAQ so we don't have to have a "should question X exist?" each and every time this line is crossed. Draw the line, and when another similar issue comes up, cross it, explain that you're crossing it, refer to the policy, and then we won't have so much side discussion. It depends on the situation being promoted. I for one think the Jobs status bar message was totally unnecessary, but if you read about what this is about I can very much understand why this is important. Beyond making noise there is not much I can personally do to help, but I'm prepared to put up with a 10px banner for issues than genuinely do affect a site I use in my professional life every day. I don't live in USA either, but that only makes me regret I cannot "call my senator" (not that I really believe it would change anything, but still). And I fail to see how this little bar can really annoy someone so much. I think its real purpose is to make people look around to see what's going on and think a little. I hope that message just does it. why do you care so much?.. I agree 100% percent with you. However on this specific case I really don't. Well if others have the same possible implications I wouldn't mind seeing it. The implications of this can be really really bad for the internet as we know it. As one of the sites / organization with a huge influence (hopefully) I expect them to do it! It will be the big tech companies who may be able to prevent such draconian measures. And we will all benefit from this. And it's true, but it is not necessarily a good thing. Let me first say that I agree a 100 % with your cause. I have strong feelings about censorship in the country that hosts 9 out of 10 web services that I use and, if your senators would at all about an alien's opinion, I would inform them that I do. Your idea of creating awareness certainly worked out as the posts on meta alone have over 10k views. I also found the news about Steve Jobs passing away interesting and I was certainly pleased to be informed about the Moderator election. But please add an option to hide these banners after reading them. I have no problem seeing them once, but I certainly do not need to see them every time I visit any site on Stack Overflow. The color is so different from the rest of the interface that the banner immediately captures my attention, distracting me from the things that I actually wanted to read. There's one very important point - the issue is not social and is not political, it is legal and legal means it will influence everyday lives of real people. An adopted act of law (any act - not only SOPA) will not be an inert piece of paper, instead it will have the Power of Law which means courts and law enforcement and government agencies - the bodies of power - and also state and private companies will act upon that law. Government adopting a law is not politics as in "some crap noone cares about", it is life as real as it can be. Since this specific act affects (or even just looks affecting) SE functioning it is only reasonable to bring it to SE users attention. Please do use StackOverflow to promote causes like SOPA, if you feel it can help a good thing and protect our freedom! For all those system message haters - I've made a quick chrome extension which just applies a bit of css to hide the banner - download it here. To get the banner back, simply uncheck the enabled box in chrome://extensions. Hope this helps. I think its worth considering as an action of Stack Exchange Inc, as opposed to "Stack Overflow" as a website. Corporations might not have a conscience, but the people within it do. And sometimes they feel the need to use the tools and platform they have on hand to do the best they can. Unlike Google - an protest at SE wouldn't exactly hit the news. Overdone, it would kill off interest in the site, but once in a while its good for programmers and non programmers alike to peek out from our keyboards and go "Hey, there's something going on". Meta's about as good a place for this as any for this. There's some condoned meta content that's not quite just about how the site is run, but also about the community. I did talk about the conscience of the people of a company right? Well, this is how its communicated. This is how Stack Exchange Inc, the company, and the people who make it up go "We feel this is important" to the folks who make up Stack Exchange the community. So, twice in 6 years? Talking about things that matter? I dunno. I can live with that. What has SOPA got to do with me, as I don't live in the USA? Not the answer you're looking for? Browse other questions tagged discussion system-message politics . Why is there rep on Meta?